The end of the school year is near and summer is just around the corner. Finding engaging activities to do while keeping cool in the valley of the sun can be a challenge, especially when you are on a tight budget. Here are some great ideas for free and low cost activities that are sure to keep both you and your child engaged mentally as well as physically this summer. 1. Take the kids to the library. Many of the libraries in the Phoenix area have story time for younger children and programs for older ones that are at no cost to you. Older children can even volunteer at their local library for the summer. Check out your local library for specific information. 2. Take the family on a factory or store tour. Cerreta Candy Company and Stuffington Bear Factory are offer free tours. Cabelas in Glendale has a collection of over 400 stuffed animals on display that are sure to wow you and your kids. 3. Go swimming. There are community swimming pools all over Phoenix and the valley which offer classes and swim and diving teams at a nominal cost. Check out your local city parks and recreation for more information. 4. Check out your local community center or city parks and recreation department for a schedule of classes and programs. Many cities and community centers offer classes, sports and other programs for kids as well as adults. 5. Cool off in the mall. Many malls have indoor play areas and even rides for young kids. Westcor malls offer a kids club as well. 6. Take a ride on the light rail and visit downtown Phoenix or Tempe. An all day pass is only $3.50. 7. Spend a day at Kiwanis Park in Tempe. The huge park has many amenities such as ramadas with picnic tables, boat rentals, an indoor wave pool and recreation center. Admission to Kiwanis wave Pool for children 2-12 is $5 and age 13 and up is $7. Arizona Museum for Youth-Free First Sundays. The museum is offering a 50% discount to teachers during the month of June. Heard Museum-Free Second Sundays most months. YOGA IN THE PARK IN PHOENIX! Get some fresh air and exercise while participating in the Yoga Rocks the Park series held Sundays through May 6 at two central-Phoenix parks. The series began three years ago in Denver as a benefit event for Yoga World Reach, a non-profit offering yoga and other alternative therapies to trauma victims around the globe. Kristina Krump, 33, event coordinator for Yoga Rocks the Park, wanted to bring the weekly event to Phoenix to partner with Valley non-profits. Participating groups include Teach for America, Free Arts of Arizona and the Real Gift Foundation. The hourlong classes are for yogis of all experience levels. Different instructors lead the classes to provide a variety of teaching methods and experience each week. “They (instructors) might give a pose that’s more of basic and add options with various levels to that,” Krump said. Musicians, including two from Los Angeles, will perform during the classes, making for an eclectic mix, she said. Registration begins at 1 p.m., and vendors and complimentary services will be available, including mini massages, acupuncture, hula hooping and more. 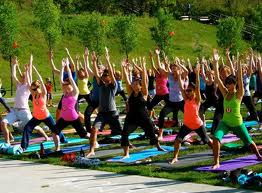 The event also features a Camp Yoga Rocks for children 3 and older hosted by Lil Yogis at Play. Dogs also are welcome. Participants should bring a mat and towel. SmartWater will provide water and host a giveaway for a six-month supply of water. Details: 2 p.m. Sundays through May 6. Steele Indian School Park, 300 E. Indian School Road. Margaret T. Hance Park, 67 W. Culvert St. $10. Save $5 when you register online. yoga rocksthepark.com. The Arizona Science Center located in downtown Phoenix is currently featuring an exhibit of Vincent Van Gogh’s work entitled Van Gogh Alive the experience. The exhibit is a display of the art of Van Gogh combined with video and sound technology creating a multi-sensory experience. 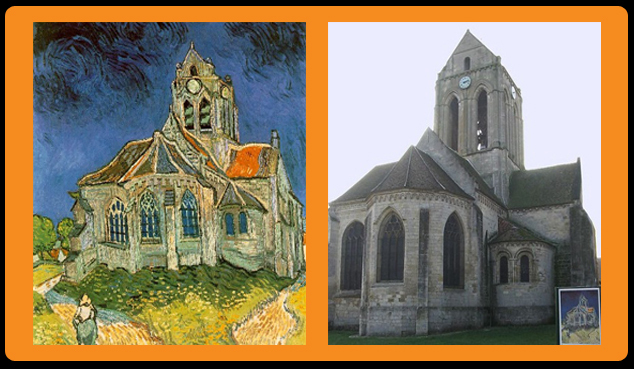 Throughout the 25 minute presentation, selections of Van Gogh’s artwork are magnified on multiple video screens as classical music plays. 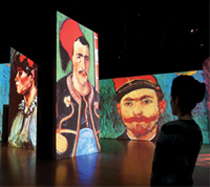 The audio visual display brings Van Gogh’s art to life for the viewer. Admission to the exhibit includes an all day pass to the science center. I suggest planning a day with your family to explore the center as well as the Van Gogh exhibit since it is relatively short for the admission price. The science center includes areas for computer and Internet technology, solar and green energy and the human body. Many of the displays are very hands on and fun for adults and kids alike. The Van Gogh experience is on exhibit at the Arizona Science Center through June 17. The Arizona Science Center is located at: 600 E. Washington St. Phoenix, AZ. Admission is $25 for adults and $20 for children. 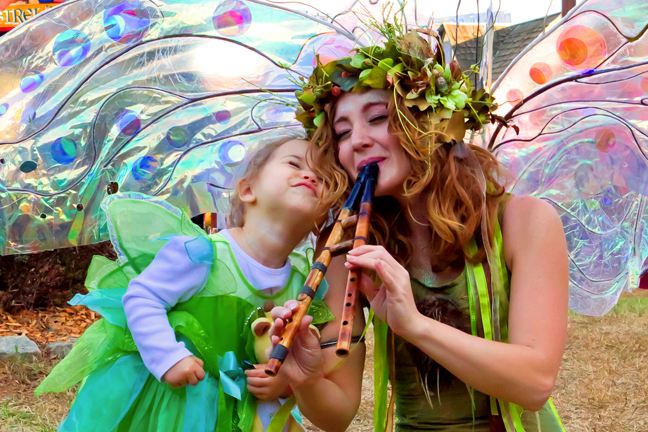 Arizona Rennaissance Festival Open Through April 1st! A great place to have fun with the family. 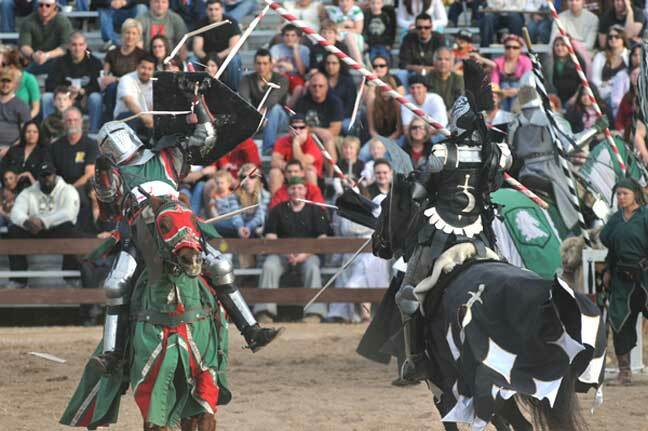 There are a lot of activities for kids, jousting and fun. Look out for the food though, while there are some healthy choices, a lot of it is high calorie. A roasted turkey leg is not really a bad choice to splurge, but the cinnamon almonds are even better. Kids and adults will do a lot of walking, be outdoors, and have a lot of laughter from the funny shows. You can get discounts at Fry’s or online, otherwise tickets are $22 per adult and $12 for kids 5 -12. Kids under 5 I believe are free, but you might want to check for sure. Waterparks are About To Open for the Summer! A great way to cool off in Arizona and to have good healthy fun with friends and families is to go to a local waterpark. With the weather warming up, they will be opening up. The following is a list of four of the locations. Remember, fun, exercise, cooling off, reducing stress and having fun with family and friends are all great for healthy living. Treat yourself! Thrill seekers can test their mettle on the Black Hole, Tornado Twisters or Hurricane Slides, while those less in need of an adrenaline fix will enjoy the White Serpentine or even the Otter Slides that drop gently into Bora Bora Bay. Toddlers will adore Captain Cook’s Landing, where they can play on a giant frog, seal, turtle and an alligator. The Waikiki Beach Wave Pool holds the title of first wave pool in the United States, and its 2.5 million gallons of water make it the third largest wave pool in the world… not to mention a fine place to lounge between thrills and take a (mental) vacation to the Islands. Details: Opens for the season on weekends May 5, daily May 26. The park closes for the season Sept. 16. 10 a.m.-6 p.m. daily. 1500 N. McClintock Drive/Hayden Road, Tempe. $3-$26, season pass $69. 480-994-2297, bigsurffun.com. The Valley’s largest water park kicks off its second season featuring a slew of rides and slides, including the Maximum Velocity Dueling H2O Coaster, which is billed as the only one of its kind in the world. The side-by-side slides, which feature more than 830 feet of drops and curves, allow visitors to race in tandem tubes. In some sections, jets of water blast riders uphill. 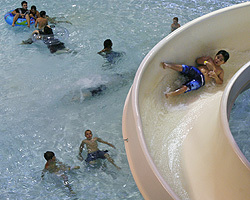 The park debuted the Constrictor last year, a multi-person corkscrew flume slide with the tightest turns around. 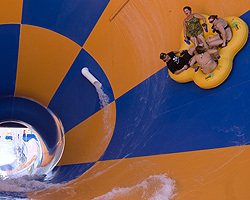 Body surfers can practice their skills in the four-foot swells of the Monsoon Bay Wave Pool, while the whole family will enjoy a whitewater rafting adventure down the 600-foot-long Raging River, which features steep drops and sharp turns. Littler guests will enjoy the interactive Soak ‘Em Playground, where they can splash to their hearts’ content in a variety of sprinklers and spouts, or dance in a mushroom water shower. The Cactus Cooler opens for the season on March 26, and an 8 p.m. “Dive ‘n’ Movie” will be held Friday evenings June 1-Aug. 10. Details: Opens for Spring Break Mar. 17-25, then on weekends Mar. 31 and daily beginning May 24. 11 a.m.-5 p.m. through May 20, 10 a.m. with varying closing times starting May 24. The park closes for the season Sept. 9. 4243 W. Pinnacle Peak Road, Glendale. $29.99-$36.99, season pass $54.99-$84.99. 623-201-2000, wetnwildphoenix.com. No doubt Sunsplash fans are anxious to try the thrilling new red and blue Revolution after watching it take shape this winter while motoring down US 60. Starting from seven stories up, this slide will catapult riders straight down into a giant open cauldron. Take your Dramamine and check out the waves at the 450,000-gallon Thunder Bay Wave Pool, or take a leisurely float trip down the 800-foot-long Endless River. Stouthearted visitors will enjoy the Master Blaster Water Coaster, as well as the stomach churning adventure of a speedy cruise down the nearly seven-story-high Thunder Falls. Details: Opens for Spring Break Mar. 10-18, then on weekends Mar. 24 and daily beginning May 25. 11 a.m.-7 p.m. with late hours for Wild Week Nights and Night Splash on select evenings (all hours vary, check the website for details). The park closes for the season Sept. 16. 155 W. Hampton Ave., Mesa. $3-$27.99, season pass $79.99, $64.99 for early birds. 480-834-8319, golfland.com/mesa. This indoor swimming pool/water park may not feature the assortment of elaborate, high-energy rides as the major water parks do, but it’s an ideal choice for younger swimmers, seniors, families with children or anyone else looking for a relaxed, and much less expensive alternative. 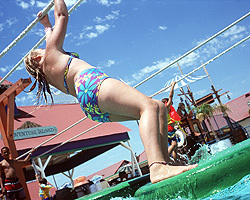 Rent a raft or tube ($5 a single, $8 a double) and bob along in the 3-foot-high waves, or take a ride down the 15-foot-tall, 127-foot-long, double-spiral slides. No water wings, inflatables or other flotation devices are permitted in the pool, where the water is always a balmy 84 degrees. Life jackets may be rented on site for $3. Towel off and enjoy the batting cages, tennis courts and other facilities at the park. Details: 1-5 p.m. Saturdays through March 31. Kiwanis Park Recreation Center, 6111 S. All-America Way, Tempe. $2-$6. 480-350-5201, tempe.gov/pools/kiwaniswavepool.